Hello and welcome back to my weekly installment of Furbaby Fridays with Dr. Tammy. This week we are counting down to Easter and I thought today would be a great time to remind folks about the dangers of chocolate. This tasty treat comes in all shapes and sizes and formulations whether in cocoa products like candies, cakes , cookies and brownies, but also in cocoa beans and mulches. The most accidental exposures of pets to chocolate of course occur more around the holidays and Easter is a big one. Because dogs tend to be the pets that tend to eat just about anything, we don't usually see cats with this toxicity, but there are a few of those pesky felines who pretend they are dogs and ingest some odd things. 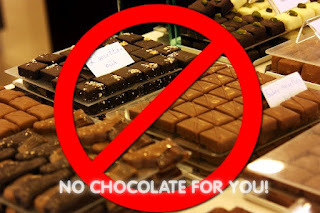 So to be safe, keep chocolate away from all fur babies. This includes some cocoa bean hull mulches. Not only do the mulches smell like chocolate Pop Tarts, they are readily available for pet for some pets because of their use in gardens and landscapes. Of course the makers of the mulches will say there has only been one documented death from the ingestion of these kind of mulches, this does not mean that animals are not sick from them. In fact, even Hershey one of the makers of these mulches admit that 50% of dogs who ingest their mulch can get sick from it. Here's an article by snopes.com that talks a bit more about it. What makes chocolate toxic to animals? Methylxanthines are the culprits here, specifically theobromine and caffeine. That's right. There are TWO toxic components in chocolate and each will vary in concentration depending on the type of product. The rule of thumb is the darker the chocolate the higher the amounts of both of these compounds. White chocolate has 0.25mg theobromine per ounce and 0.85mg of caffeine per ounce. In contrast, dry cocoa powder has 737mg theobromine and 70mg of caffeine per ounce. Now what does that mean? Animals can show mild signs after only ingesting 20mg/kg of either theobromine or caffeine. Severe signs are seen at 40mg/kg and seizures at 60mg/kg. So if you have a 20 pound dog (roughly 10 kg) it would have to eat 400 mg of the toxins to start showing some signs. So only 1/3 of an ounce of the dry cocoa powder can be dangerous and only one ounce of the cocoa bean hulls in the mulches could do it as well. Less than 1 ounce of milk chocolate per pound of body weight is potentially lethal for dogs. Milk chocolate is nearly 100 times as toxic as white chocolate. Baker's chocolate is SIX TIMES more toxic than milk chocolate. A lot of figures, I know but I wanted you to see the comparisons. If your dog decides he likes your dark chocolate candy bar you've been saving in your purse, you very well may have an emergency on your hands. For an article about chocolate intoxication and a chart that includes the amounts of the types of chocolates and caffeine sources click HERE. It's a page on the ASPCA website with articles aimed more for veterinarians. The article is a PDF that will download to your computer if you click on the link. It's not only the actual amount of chocolate we have to worry about when our pets ingest these kinds of foods. More often than not, the ingestion takes the form of eating candy in wrappers. Those can be just as bad leading to obstructions in the stomach and bowel loops. Even if the mulches are of the variety that have been treated to remove the theobromine, the debris itself could cause an obstruction if enough is eaten. What are the clinical signs to look for? Usually withing six to twelve hours of ingestion you will see the first clinical signs. These include polydipsia (drinking a lot of water), vomiting, diarrhea, bloating and restlessness. If enough of the chocolate has been ingested, the signs can progress to an animal that ends up extremely agitated/hyperactive, urinating a lot, tremors or even seizures. Other symptoms include high heart rates, arrhythmias, elevated body temperatures, coma and even death. It's the arrhythmias that can cause death in these patients so it's imperative that you seek immediate veterinary care if your pet gets a hold of any kind of chocolate. It's better to be safe than regret it later. How is chocolate intoxication treated? As soon the pet arrives, the veterinary staff will be in motion. Stabilization first involves decontamination of the stomach by inducing vomiting. This will be done only if the patient is stable enough for it to happen. If your dog is seizuring, the induction of vomit will NOT occur. Instead the seizures will be brought under control first. Once more stable then decontamination will occur using stomach tubes to remove as much of the chocolate that remains and to administer activated charcoal without sorbitol. (In the paint ball toxicosis article you will recall that sorbitol is one compound that can cause issues all on it's own. Intravenous fluids, close monitoring of vital signs to make sure elevations of temperature and heart rates don't occur. If the signs do progress, then medications are administered to control seizures and arrhythmias. Usually our patients present early enough that just 12 hours of IV fluids, and monitoring are all that's needed after the decontamination. Activated charcoal is sometimes split into three different doses in order to continue to absorb any chocolate that got into the intestinal tract. The patients that have the longest recovery are those who are treated after the bad symptoms have already started or they've ingested chocolate that contains other "ingredients" such as marijuana, laxatives, "magic" mushrooms and other recreational drugs. So do yourself and your pets a huge favor and lock up all products containing chocolate and caffeine. Even if it's white chocolate containing very little toxin per ounce, it's best to just keep it out of reach. Don't leave any candies out in dishes, Christmas stockings, wrapped under the Christmas tree, in Easter baskets accessible to pets, boxed chocolates on Valentine's Day, or baked goods out where your pets have access. I know that all seems like common sense, but you'd be surprised by the number of folks who say "my dog never jumps up on the counter. Why would I put the chocolate away?" Here's another good one, "It's a dog. They don't eat chocolate." #FurbabyFridays: A Penny For Your Thoughts? NOT!